As those of you who know me in real life or who have been reading this blog for a while already know, I spent the first 23 years of my life in Virginia. I grew up in the Piedmont area & didn’t really get into hiking until I went to college in the mountains of SW VA. During the five years my husband & I spent in that area, we explored numerous trails in that region of the state, including all of the famous hikes such as McAfee’s Knob, Dragon’s Tooth, & the Peaks of Otter as well as several lesser known trails like Mill Creek, Rice Fields, & Burke’s Garden. We’ve been in NC for almost three years now, but being a bit further from the mountains than we’d truly prefer, we don’t yet feel like experts on the trails of this state, although we have certainly hit many of the highlights such as Mt. Mitchell, Hanging Rock, & Stone Mountain. In any case, today I thought it would be fun to share some of my knowledge of VA’s hiking trails, particularly those that are not quite so well known. 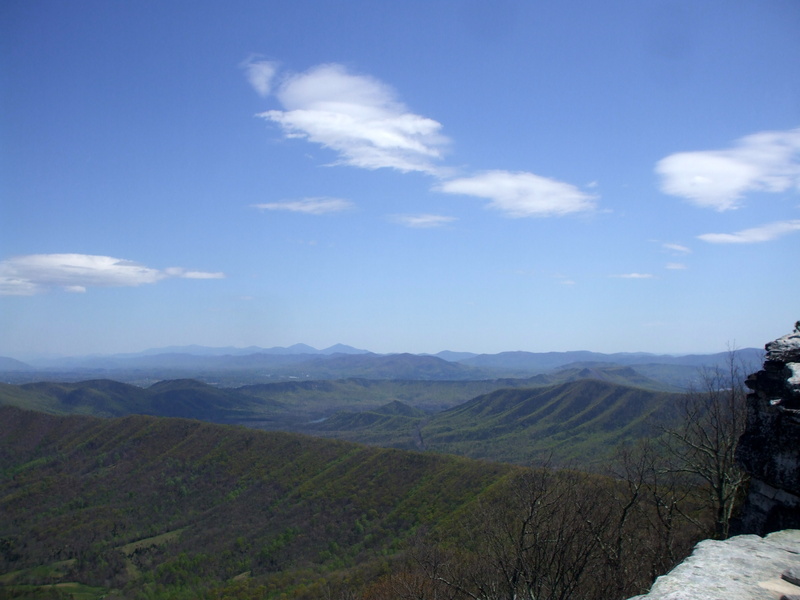 Any list of the best hikes in VA is definitely going to include such gems as McAfee’s Knob, Dragon’s Tooth, & Old Rag, so I’ll skip those because, while all fantastic, I’m assuming that if you’ve lived in VA for any amount of time you’re probably already aware of their existence. Instead I’m going to share those lesser known trails that I think are simply too beautiful to miss (& usually a lot less crowded too, which for me is always a huge perk). *All the pictures are my own. 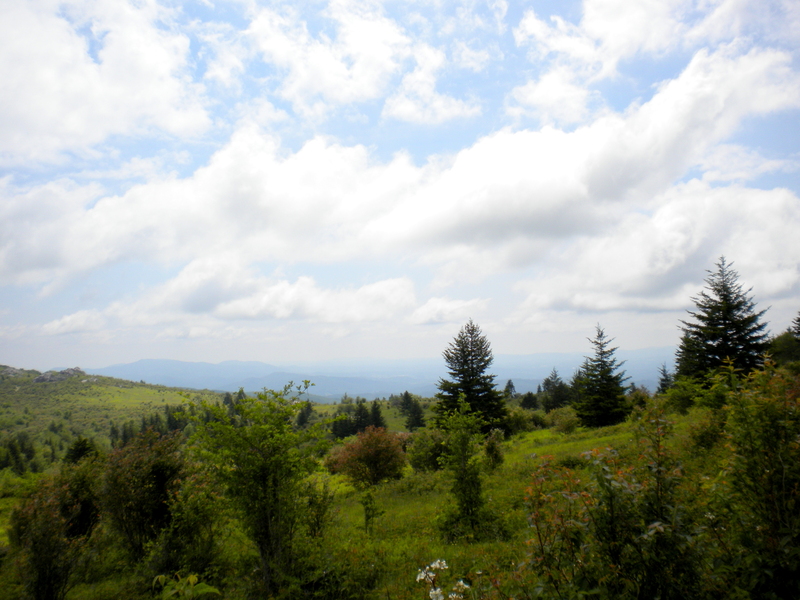 Grayson Highlands State Park: Grayson Highlands State Park adjoins Mt. Rogers which, as you may know, is the highest point in VA. However, being wooded, there is no view from Mt. Rogers whereas there are spectacular 360 degree views all over Grayson Highlands. (You can easily hike from Grayson Highlands over to Mt. Rogers if you do desire to see the state’s highest point.) 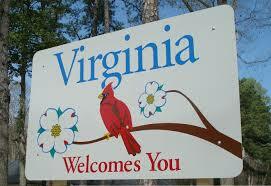 This is truly a place like no other in VA, & I’m always amazed at how few Virginians have actually been here. It’s the one place in this state in which you can get a small taste of what the mountains feel like out West. Additionally there are wild ponies roaming the park & numerous gorgeous wildflowers dotting the landscape as well. My husband & I have been here at least four times over the past few years, & yet we are always anxious to get back. Considering this is some of the highest elevation terrain in the state, the hiking is actually quite easy. Most of the elevation is achieved while driving to the park, so once you get there you’re basically just hiking the ridgelines. I will warn you to be sure to wear sunscreen. Because much of the park is un-wooded, you get a lot of direct sun exposure as well as a fair amount of wind. This is definitely not winter hiking as the temperature tends to be a good 15-20 degrees cooler than areas with lower elevation. As far as distance, you can hike as little as 1-2 miles & still see plenty of gorgeous views, or you can hike about 8-9 miles round trip if you want to go all the way to Mt. Rogers & back. I can’t say enough good things about this park; just go & thank me later! Upper Cascades/Barney’s Wall: Anyone who’s been to VT or Radford is probably familiar with the ever popular hike to The Cascades, a gorgeous waterfall in near-by Giles County. It’s a relatively easy hike that is well worth your time despite being very crowded much of the year. (I’d highly recommend going in the winter when the waterfall is frozen. In my opinion it’s even more beautiful then & considerably less crowded.) However, what few realize is that if you continue just a few miles further up the trail you can reach a second (albeit less epic) waterfall which is basically abandoned as well as a huge cliff with gorgeous views called Barney’s Wall. There is actually another way to access Barney’s Wall that doesn’t involve walking past The Cascades, but the one time we tried it the roads were so muddy & full of so many potholes that we truly could not pass. In any case, the round trip from the Cascades parking lot to Barney’s Wall & back was probably about 6-8 miles. We only did it once & it was quite a few years ago now, so my memory has faded a bit. What I do remember is enjoying the solitude at the Upper Cascades & some gorgeous views at Barney’s Wall. A word of warning: when we were there about 4-5 years ago, the sign denoting the side trail to Barney’s Wall had been knocked down. We actually missed the entrance to the trail & had to turn back to find it. I have no idea if the sign has since been righted or not. Just be on the look-out for it. Burke’s Garden: For some reason I remember learning about Burke’s Garden in elementary school. I have no idea if it was something we discussed in school or just something I found when studying a map. (I was & still am one of those odd people who could spend hours poring over a map!) In any case, it is a truly unique place in VA, being a very isolated mountain-top valley in Tazewell County. There is literally one road in & one road out of this valley, & the northern end of that road is gravel & questionably passable by anything other than true off-road vehicles. (We never tried leaving that way since at the time we were driving my husband’s Chevy Cavalier, not exactly off-road exploring material, although I’d be willing to bet that little car spent more time off-road than most SUVs or Jeeps out there today!) Just driving around Burke’s Garden is quite fascinating; one of the first things I noticed on our first trip there was how there are literally signs pointing down roads to denote which families live there (e.g. “The Martins, the Thompsons,” etc). Talk about a place where everyone knows everyone . . . I’m pretty sure this is it! In any case, the best way that I know of to hike at Burke’s Garden is to access the AT (Appalachian Trail) off of Route 623 (the one road in & out of the valley). The road enters the valley as a paved road but turns into gravel after a few miles. It’s pretty easily passable at least up until the point it crosses the AT (which is well-labeled). After that, all bets are off. It’s a long hike, but I’d recommend hiking North on the trail until you reach the shelter at Chestnut Knob. It’s about a 12 mile round-trip hike but well worth it to explore such an isolated region. I would recommend doing this hike in early spring or Fall because at the height of summer a lot of the views into the valley are obscured by the overgrowth. A word of warning: on our last trip to Burke’s Garden we ran into a through hiker who had just come across several black bears. We missed them, but they are definitely out there. For any history buffs reading this, you will be interested to know that the Vanderbilts wanted to build their estate here but everyone refused to sell their land . . . so instead they built the Biltmore in Asheville, NC. 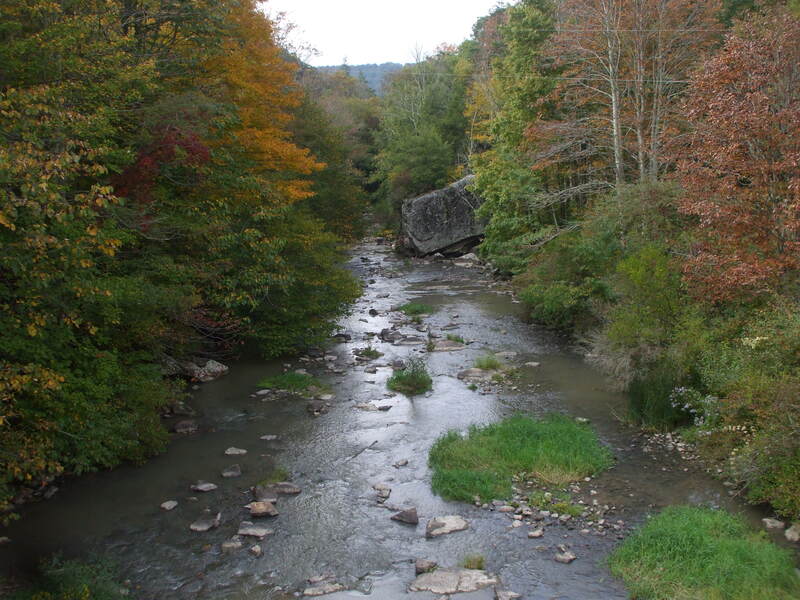 Mill Creek: This is a little-known hike in Giles County that I am only aware of because one of my husband’s former coworkers was from the area & told him about it. I would highly recommend making this a winter hike because the three waterfalls on the trail are, in my opinion, most beautiful in the winter when they are partially or completely frozen. The first time I ever actually enjoyed a beer was on this hike. It was so cold that when my husband (boyfriend at the time) offered me a Coor’s Light, I decided to try it because I thought it might warm me up. And it did! And actually tasted good too, ha! And to this day any time I drink Coor’s Light I remember this hike. 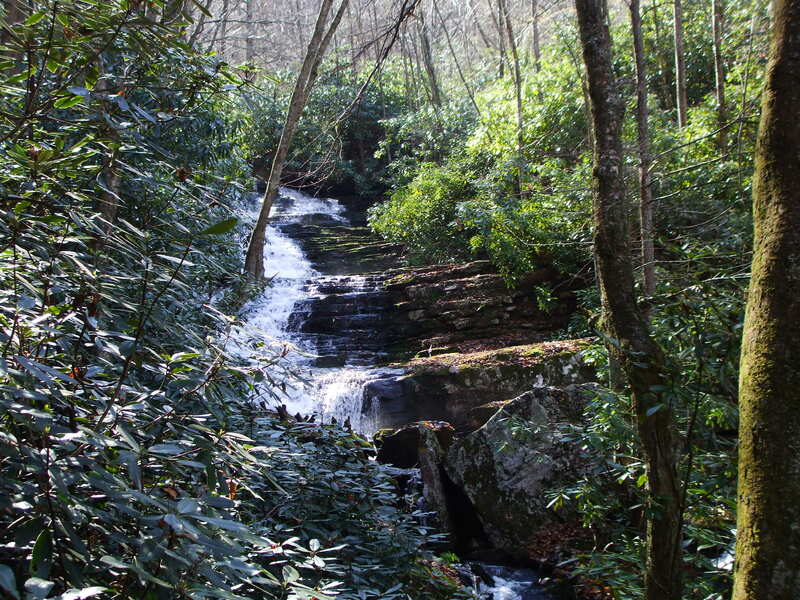 For driving directions, follow this link & scroll down to “Mill Creek Falls:” http://gilescounty.org/hiking.html. Both times my husband & I did this trail, we ran into no more than two other groups of people. It’s definitely isolated. A word of warning: be prepared to cross the creek several times. Wear shoes that you don’t mind getting wet if you accidentally fall into the creek. 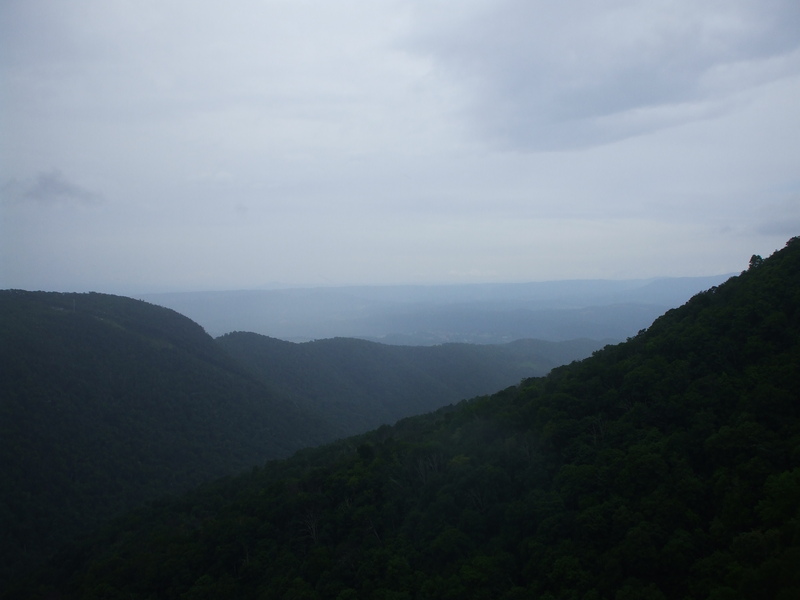 Kelly’s Knob: Here’s another great gem found in Giles County. Students at VT & Radford frequent the hike, but otherwise it seems to be little known (& it’s far less crowded than The Cascades). When you’re driving down 460 West coming up to the main entrance to the VT campus, you can actually look up & see Kelly’s Knob, but you kind of need to know what you’re looking for. 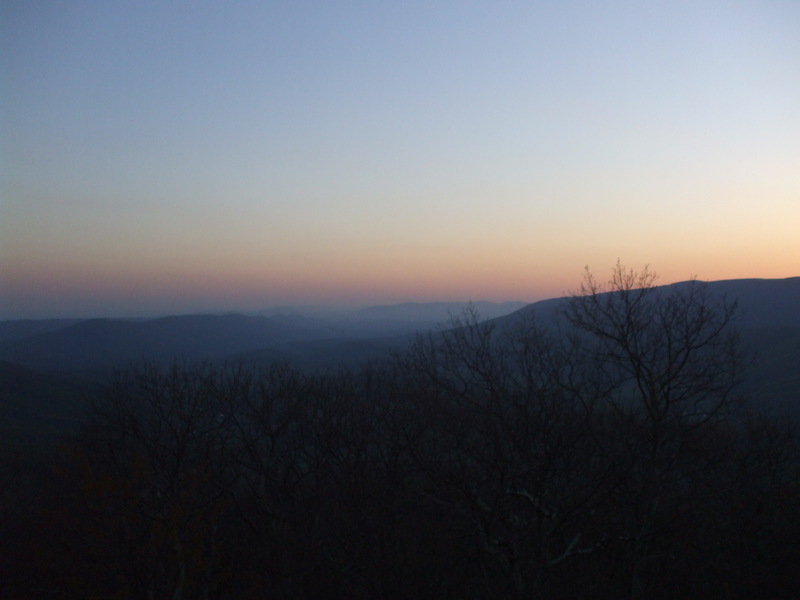 In any case, the hike offers grew views into the New River Valley & can make a great sunset hike if you don’t mind hiking downhill with a few flashlights. (I did this with some friends once, except we forgot to bring flashlights so we ended up using our cell phones & cameras as lights. Wouldn’t necessarily recommend that method, but it was a lot of fun!) A word of warning: the first bit of the hike is basically straight uphill. If you’re an asthmatic like me, be sure to bring your inhaler. When I first started taking Singulair, the biggest way I knew it was working was that I did this hike & it was the first time I’d ever done it & not had chest pain. Not kidding. After the initial uphill climb, the trail follows the ridgeline & is very easy the rest of the way. I can’t remember the exact mileage but I’d say it’s 5 miles roundtrip at the very most, probably less. House Mountain: House Mountain might be a popular hike for VMI or Washington & Lee students, but the one time my husband & I did this hike, I don’t think we came across more than one other person. Granted it was November & fairly cold that day, but nonetheless we got the impression that this isn’t a crowded destination. In any case, House Mountain is actually a series of two mountains: Little House Mountain & Big House Mountain. The trail leads up to a meadow at which point you can veer off onto two different trails, one for Little House & one for Big House. We’d read that the views were best from Little House Mountain, so the day we went we chose to only do that side because we were tired & it was quite chilly. (Neither trail is very long so you could easily do both mountains in one day if you desire.) The hike up to the meadow is nothing more than a simple walk in the woods, but the hike up Little House Mountain is quite steep. The good news is it’s also quite short so it’s over pretty quickly. The views at the top are well worth the effort expended getting there. Trust me, they do not disappoint. This is one of those hikes I really wish we had discovered earlier, but we didn’t find out about it until late Fall 2011 & then we moved to NC the next summer, so unfortunately we only did this hike once. Mt. 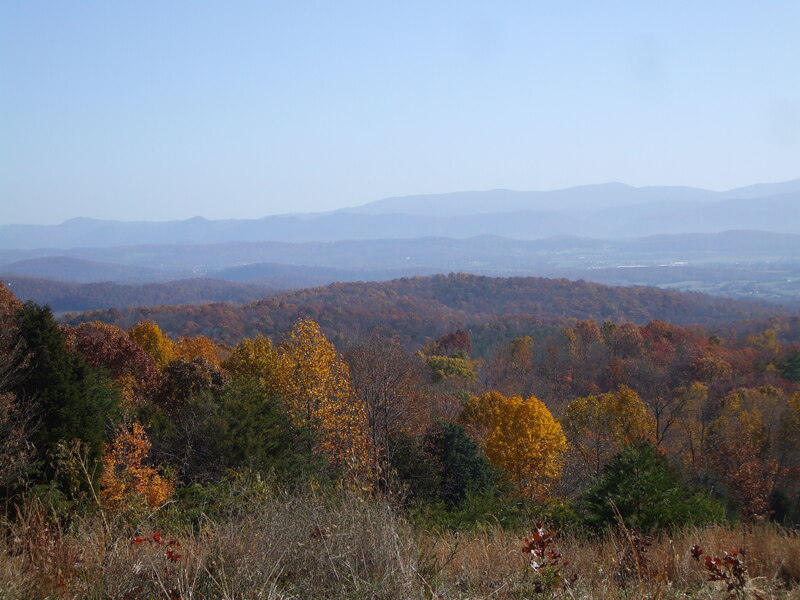 Pleasant/Cole (or Cold) Mountain: This is a series of trails in Amherst County that offer spectacular views, but the trails are relatively easy & definitely not crowded. I’d recommend going in the spring when the rhododendrons are in bloom. 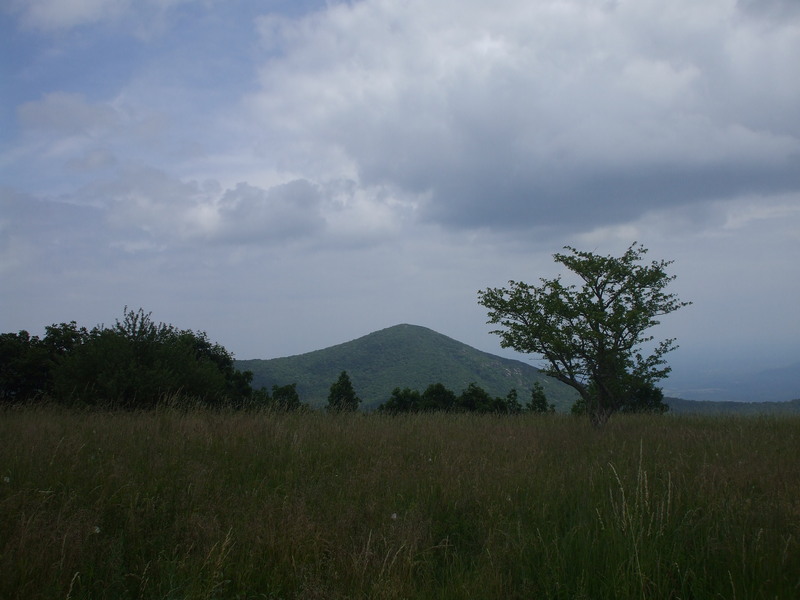 Cole Mountain, which is alternately called Cold Mountain, is a bald mountain that offers fantastic views of the surrounding area. Mt. 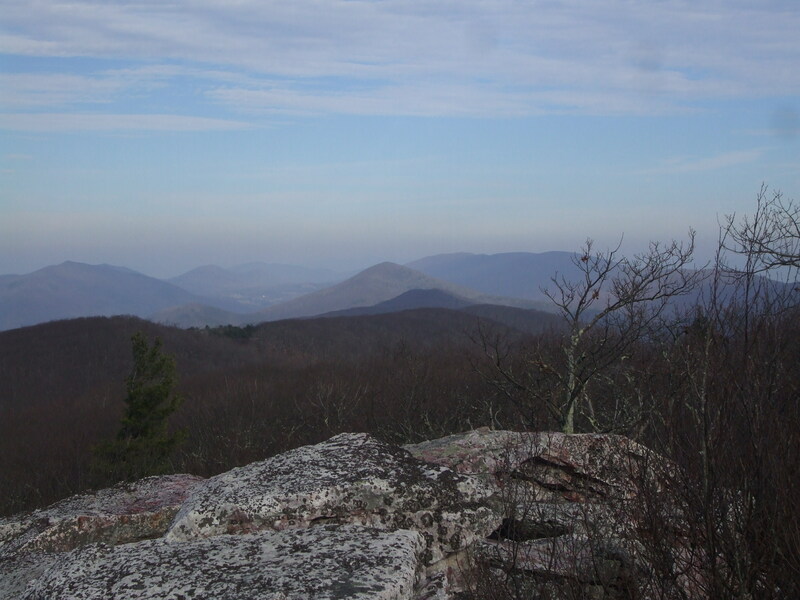 Pleasant has multiple rocky outcroppings from which you can look over onto Cole Mountain & the surrounding area. If you’re an inexperienced hiker but you would love to see some fantastic views, this would be a good place to start. You can easily do both trails in one day, as we did when we visited here several years ago. Whether you’re a new or experienced hiker in the VA area, I hope this list has been beneficial to you in planning your next adventure. Please feel free to comment below on any of the hikes for which you have questions or concerns. I’d be happy to assist with driving directions or other inquiries. If you do decide to check out one of these trails, please let me know & share one of your pictures as well, if possible. I’d love to see/hear your stories. Happy hiking! Great read. I would love to find a person or group to do off trail hiking.